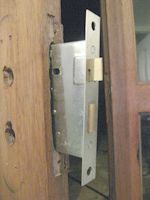 That’s all I needed…..I went to go and lock my back door, only to find that the locking mechanism had finally broken and there’s no way I can get it locked, so now I have to go out and buy a new locking mechanism and replace the broken one. No problem, it’s a 5 minute job after you have bought the new locking mechanism. 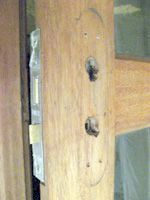 After removing the handles, you can now loosen the screws that hold the locking mechanism in place on the front part of the door and remove the locking mechanism. 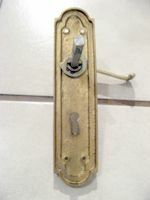 Now that you have removed the locking mechanism, take it with you to the hardware store to but the new locking mechanism. 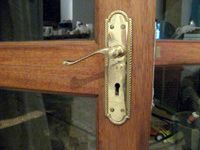 The reason for doing this is because there are so many different door locks on the market that you need to be sure of the one that you are replacing. 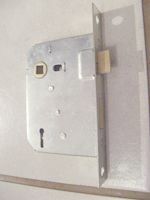 That the keyhole is positioned in the right place or the locking mechanism will not fit correctly into the door. If you are not sure, then ask the hardware store for help and advice on buying the correct one. 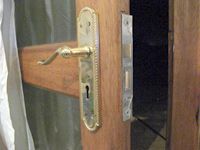 Now that you have the new lock back at home, you can insert it into the hole in the door where it should go, fasten it in place with the screws, insert the handle pin through the hole and put the door handles back on and fasten the screws. 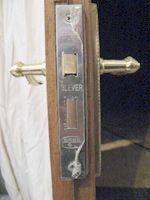 You now have a new door lock that works and you can now lock the door again.